It is always amazing for us to share a daring Fashionisto wearing pearls– and this is your lucky day! This Fashionisto was chosen as our “Fashionisto of the Day in Pearls” because he made use of his extreme style by wowing us. Check out the beautiful artsy headpiece with pearl detailing! 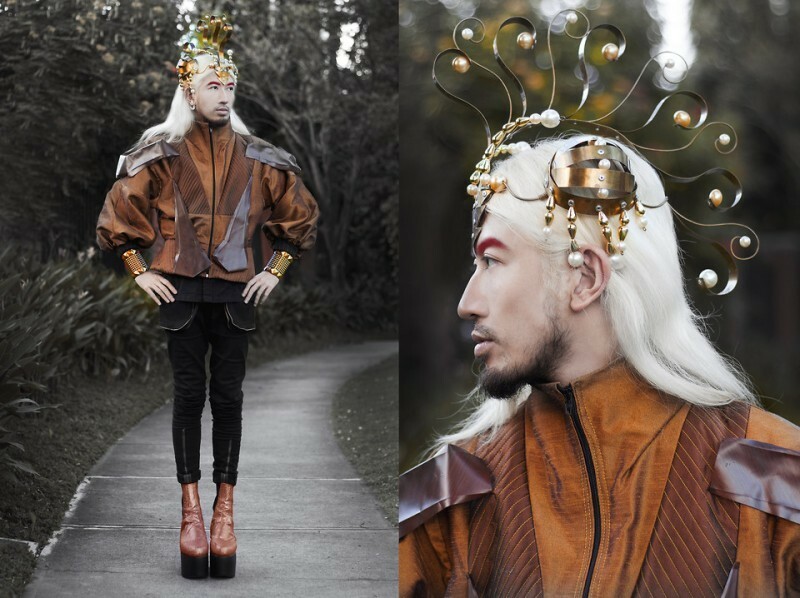 Andre Judd, blogger of The Avant Gardien, showed off his bold style with a beautiful Copper Headpiece accented with Pearls by Van Cleefus, a Copper Silk Taffeta Couture Jacket by Jan Garcia, black skinny pants and platform boots. “Midcentury sci-fi, 80s cartoons Silverhawks with the character named Copper Kid. This is my take on futurism. Originally this look was supposed to be a joyous and optimistic post. Few hours ago I read that Nicolas Ghesquière, one of the most influential designers in fashion and my foremost fashion hero left Balenciaga. I was so devastated. He was responsible for inspiring me to pursue fashion as a career. His vision was and still is so influential that fashion follows after him. I don’t know what will happen hereon but for now I’m mourning the loss of the greatest fashion collaboration in history. We think this Fashionisto looks great from head to toe (especially his edgy hair), and we are sure that you will love his look as well.